I’m extremely disappointed that Governor Wolf chose this week to veto emergency funding approved by the Legislature as part of a “stop-gap” budget bill that will keep money flowing to schools and community organizations while we continue to negotiate a budget. By vetoing the emergency funding plan, the Governor is leaving $3 billion of money for schools and hundreds of millions of dollars for social service agencies sitting on his desk. Local schools are among those that will run short on money by December. You can view the full list here. The state hasn’t stopped collecting taxes. Those funds should continue to go to help educate our children and take care of our neediest citizens. Since the governor vetoed the Legislature’s original budget in June, we have offered to match his proposal for school funding. We met or exceeded his request on 70 percent of budget items. The Governor still said no. It’s becoming more and more clear that for the Governor this budget impasse is about one thing – achieving a tax increase of historic proportions. The people of Pennsylvania do not want us to raise their income taxes and sales taxes by $4 billion. His tax proposal includes a 14 percent increase in just your income taxes, not to mention the other taxes you will pay on goods and services. We have real differences. While I am disappointed by the governor’s latest rejection, we remain ready to talk further and ultimately pass a fiscally-responsible budget for the citizens of Pennsylvania. Pennsylvania’s motorists can now access real-time information on transportation projects that have been completed or scheduled through 2026 at a new website developed by the Pennsylvania Department of Transportation (PennDOT). I strongly supported passage of Act 89, which is providing critical investments in Pennsylvania’s transportation system. The comprehensive funding legislation enables the state to address structurally-deficient bridges, poorly-rated roads and underfunded multimodal projects. other planned projects in PennDOT’s Four- and Twelve-Year Plans. The website allows users to view projects according to categories such as county, statewide, legislative district and more. The construction section also allows users to better understand the estimated start and end dates of projects as well as to view projects of regional significance along Pennsylvania’s interstate system. 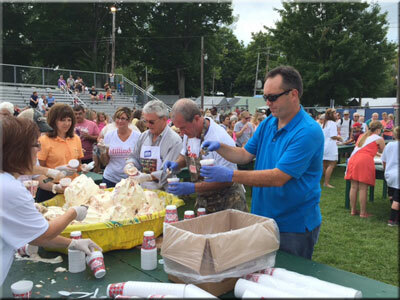 I recently joined local officials serving at the annual Giant Ice Cream Sundae at Kid’s Day at the Grange Fair in Centre County. It’s a great summertime tradition and a wonderful opportunity to meet with area residents. With Pennsylvania leading the nation in reported cases of Lyme disease, the Pennsylvania Department of Health has called for increased awareness about this serious disease. When detected early, Lyme disease can be treated with antibiotics. Left untreated, the disease can spread to the joints, heart and nervous system. Early diagnosis is important in preventing late-stage complications. The first line of defense against Lyme is to take precautions in the outdoors by using insect repellent with DEET, wearing long-sleeve shirts and long pants, checking for - and promptly and properly removing – any ticks, and showering shortly after exposure. For more information on Lyme disease and to view the latest case report, click here. Small businesses can apply now for PA Advantage Grants to help pay for pollution-cutting, energy-efficient upgrades. The grants provide funding to projects that include anti-idling technology for trucks, HVAC and boiler upgrades, high-efficiency lighting, solvent recovery systems and waste recycling systems. The program is funded by the Impact Fee paid by natural gas developers and the state Capital Stock and Franchise Tax. One hundred years of Pennsylvania agriculture comes to life in “Hold Your Horses” -- a 176-page hardcover book that captures agricultural stories from the Commonwealth’s 67 counties. 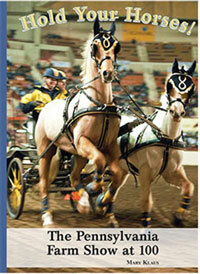 The book is being sold for $25, with proceeds going to support the PA Farm Show Scholarship program. The book chronicles the first farm show in an agricultural implements building at Tenth and Market Streets in Harrisburg through the 1929 stock market crash and the construction of the early North Cameron and Maclay Streets Complex. Today the annual PA Farm Show covers more than a million square feet of floor space and brings a taste of farm life to more than 400,000 visitors. It’s a short ride from my district and a great place to enjoy the best of our state’s agricultural traditions.